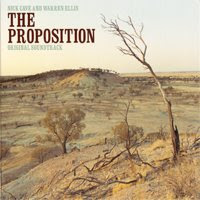 The Proposition is a 2005 movie directed by John Hillcoat and written by musician Nick Cave. It stars Guy Pearce, Ray Winstone, Emily Watson, John Hurt and Danny Huston. The film's production completed in 2004, and was followed by a wide 2005 release in Australia and a 2006 theatrical run in the U.S. through First Look Pictures. The movie was Rated R by the MPAA for strong grisly violence and for language. Nicholas Edward Cave (born 22 September, 1957 in Warracknabeal , Victoria) is an Australianmusician, songwriter, author, screenwriter, painter, and occasional actor. He is best known for his work in the rock band Nick Cave and the Bad Seeds as well as his fascination with American music and its roots. His music is characterised by intensity, high energy and a wide variety of influences. He currently lives in Brighton & Hove in England. Warren Ellis (born 1965, Ballarat, Victoria, Australia) is an Australian multi-instrumentalist and composer, most famous for his work with Dirty Three, Nick Cave and the Bad Seeds and Grinderman. He plays violin, piano, bouzouki, guitar, flute, mandolin and can program electronic loops. Ellis is also known for his excessive and eccentric, though amusing banter between songs during Dirty Three live shows. Ellis now performs with Grinderman, along with fellow bad seeds Nick Cave, Martyn Casey and Jim Sclavunos and currently lives in Paris, with his wife and two children.